We don’t need another superhero. That’s what the Venom trailers told us, and it’s pretty true. So, what Venom had to offer—an antihero, a Jekyll/Hyde thing starring a brilliant actor who excels with complex, dark roles—felt like a great change of pace. 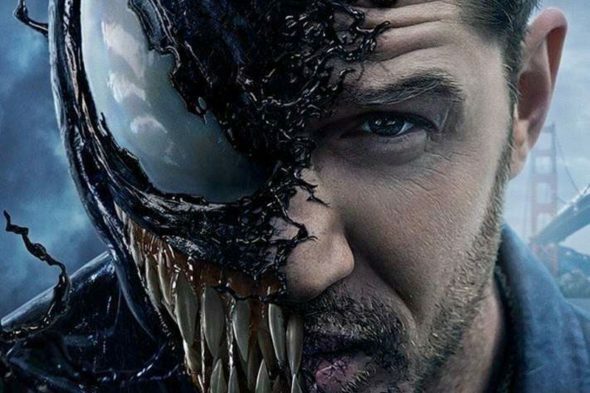 Tom Hardy was the ideal choice for the dual role of Eddie Brock, semi-doofus reporter, and Venom, flesh-eating alien symbiote. This should have worked, partly because Hardy knows how to mine villains for their humanity, and watching him wrestle with the good v evil duality never ceases to be impressive. What Venom suffers from more than anything is the expectations set by a Marvel release. Don’t be mistaken, were this the DC universe it would be the second best comic book film released since Christopher Nolan cast Hardy as a super villain. But it is, indeed, Marvel. (If you forget, Stan Lee shows up to remind you.) And for that reason, regardless of the fact that Venom boasts superior acting, FX, story arc, action choreography and writing than anything DC has done this century besides Wonder Woman, its regrettably traditional execution makes it feel a bit stale. Because it is Marvel. A characteristically committed Hardy elevates scenes, indulging a far more humorous tone than what we’ve seen lately from the versatile actor. Riz Ahmed (Nightcrawler, Four Lions) is a solid choice to play Eddie/Venom’s nemesis. Never campy or over-the-top, Ahmed evokes a type of lifelong genius who cannot be persuaded that his ideas are at odds with the ideals he alleges to support. Michelle Williams is uncharacteristically flat, and the balance of the cast is mainly forgettable, but the real problem with the film rests on uninspired direction. Ruben Fleischer showed a flair for action, colorful theatrics and humor with his 2009 breakout Zombieland, but the joy of carnage and camaraderie that infected that flick is sadly missing here. Zombieland was aided immeasurably by writers Rhett Reese and Paul Wernick, whose irrepressible irreverence made the Deadpool films such a riot. It’s a tone sorely lacking in this screenplay, penned by a team of four whose output includes a Fifty Shades film, Kangaroo Jack and Fleischer’s abysmal 2013 mob flick, Gangster Squad. Venom is not a bad movie. It’s fun, competently made entertainment.